Club Penguin Cheats by Mimo777 Club Penguin Cheats by Mimo777: Club Penguin Pet Shop Sneak Peek Reviewed By You! Q.What's a brown puffle's favorite food? For next week's Reviewed By You, Club Penguin wants to give us a sneak peek of the new Pet Shop! Do you like it? Club Penguin wants to hear what you think about it before it launches next week. What do you like best about it? I really like the play tubes? How 'bout you? I really like the tubes they look like fun to play in! I also like the orange puffle clock in the back! Awesome! I can't wait for it to come out (I HOPE the new puffle food wil be availible to everyone. I saw those tubes and wondered what they will be used for - maybe like hamster tunnels. Is that big puffle a rug? I'd like one of those at my igloo. The clock, too! Those Tubes do look cool! This is totally 21st century stuff right here.I LOVE IT!!!!! I also cant wait to see the new food and interactions that will be coming out to! I like it too!But i don't think the preps and the babys will hehe..
mimo see that orange puffle clock i think that i have seen that before! I was sad once the news came out when they would change how the pet shop looks. But this picture makes me want for it to change. It looks futuristic. Will the game "Puffle Roundup" still be there? It is one of my favorite games on there. I don't know if I'll like this change. LOL I thought the tubes were to transport Puffle O's! That's awesome! Can't wait until the Puffle Shop is done! :D The Puffles are so cute! well...i have to say that disney's way of 'drawing' cp is totally different. I like the old look of the puffles better... but the design looks really cool! Mimo? If you look carfully by the door of the futur petshop, you can see the puffle's toys. The pink puffle's skipping rope and the green puffle's unicycle. Cool huh? I totally agree with you on the play tubes, Mimo. They are cool. I wonder how I will be able to interact more with my puffles. Maybe I'll be able to play with them more and walk them differently. That's a lot to think about. LOL, there's a bug at the stage. It plays the "Penguins That Time Forgot" music instead of the "The Haunting of the Viking Opera" one. Yay, the new puffle food is gonna be for everyone, non members as well! You can see the Puffle Roundup door is still there. It's my favorite game, so I'm glad. Oh wow it looks great!!!! Hope for it being GREAT! Yep, the puffle food will be available for everyone, includng non-members! omg! that pet shop looks awesome! if i was a puffle i would want to live in that pet shop! Sooo does the orange puffle have like a HUGE mouth or somethin'. I don't know. Mimo777 I found a glitch read the newspaper put it away then the room your in will turn dark!! Hey alisufi48! Actually, you probably HAVE seen it before! There is a black puffle version of that clock in the Attic, but since it's on the wall that we can't see on Club Penguin, you can only see it in the DS games. Hey mimo. The stamps section in this month says treasure hunt. In other words.....Can you say "Rockhopper"? -Long live the king. King Mookie that is! 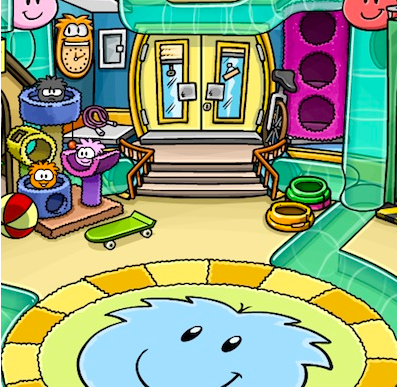 also im just glad that cp is altering ONE of their rooms! FINALLY! hey mimo i went to toys r us 2day and saw that they sell jumbo puffles! I really like how the puffles are extremely detailed. If i see red puffle cannon its be best for me and those who like red puffles! Can you add to a gem that non members can have 3 pufles and that nonmembers can bye brovn pufle.